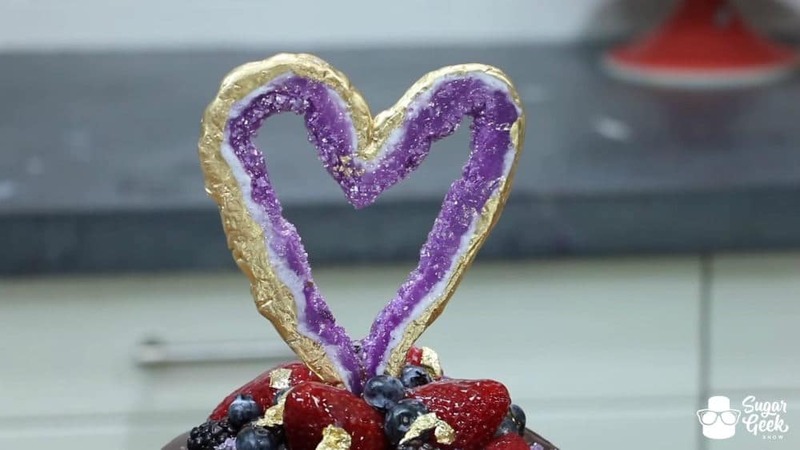 Geodes are most definitely still a hot trend in the cake world and this heart shaped geode topper is the perfect thing to top off a special Valentine’s Day cake! 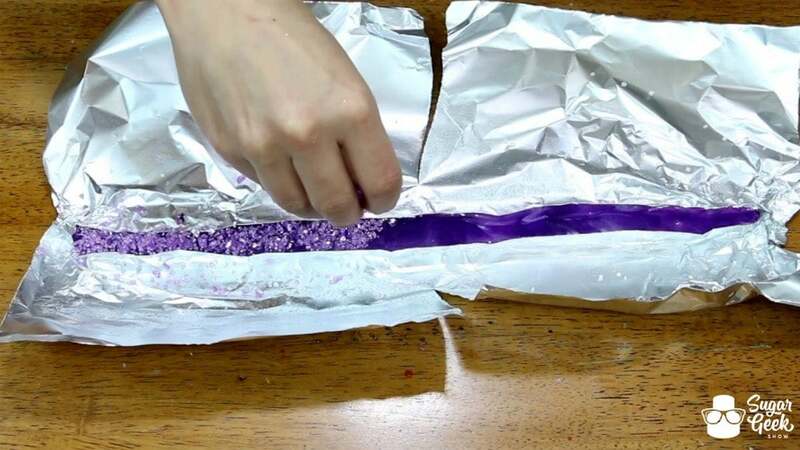 Let’s take a look at how it’s done step-by-step, I’ll bet it’s easier than you think! 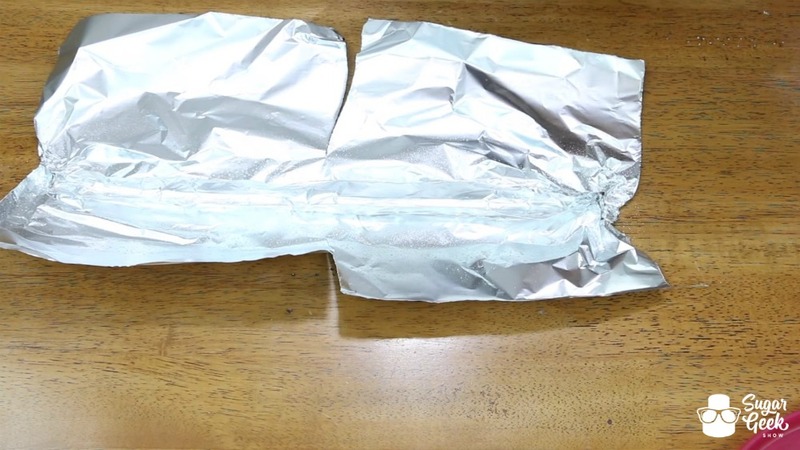 Take a good sized piece of aluminum foil and create a dam about 1/2″ wide. 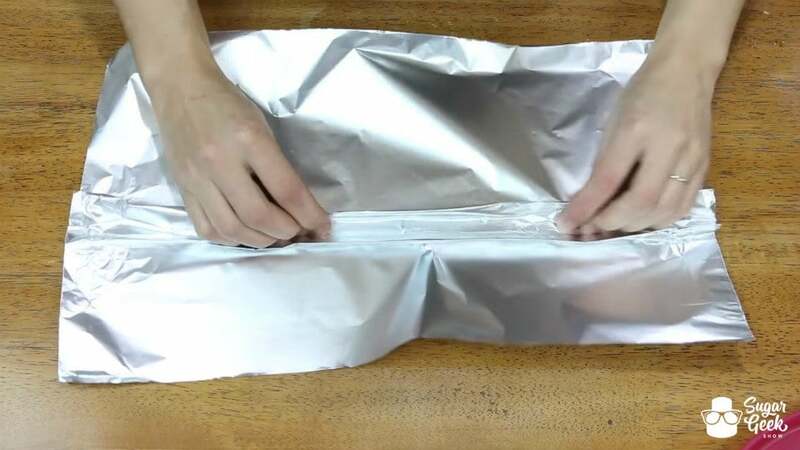 Be sure to fold in the ends to seal them up. 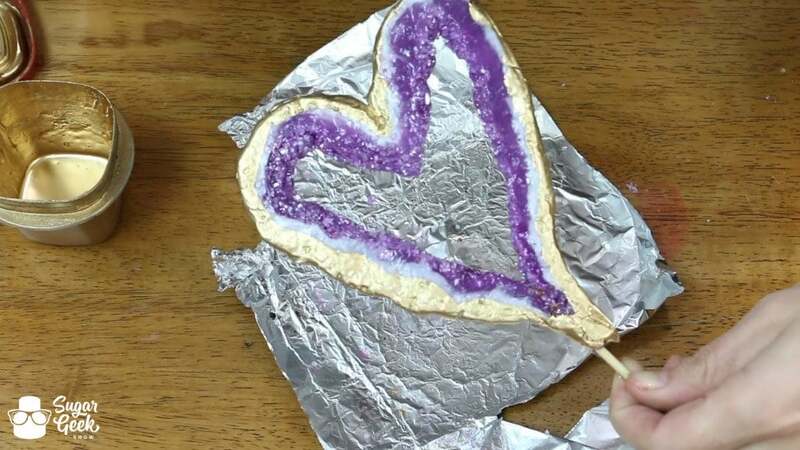 Spray your foil with just a little bit of vegetable spray to keep your geode from sticking. This is VERY important. I made this topper awhile ago and forgot to spray my foil and the foil did not come off. 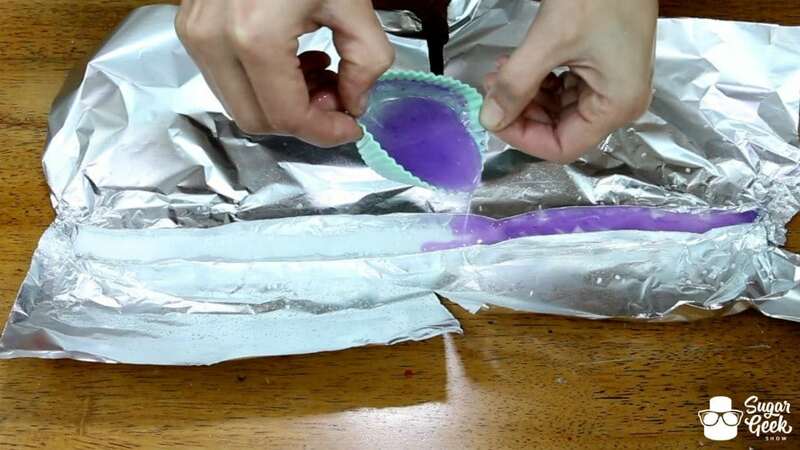 Heat up some Simicakes pre-made isomalt in the microwave in three different silicone cups. 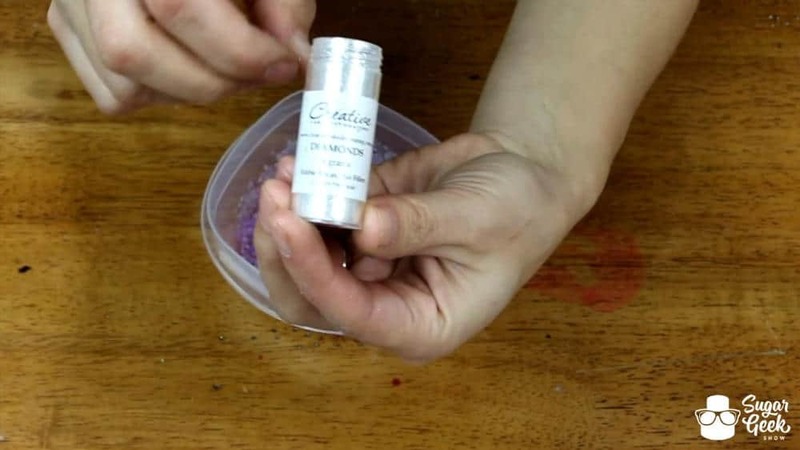 Using any food gel color, color one white, one a dark color of your choice and the other a lighter version of the dark color with a little bit of white mixed in. 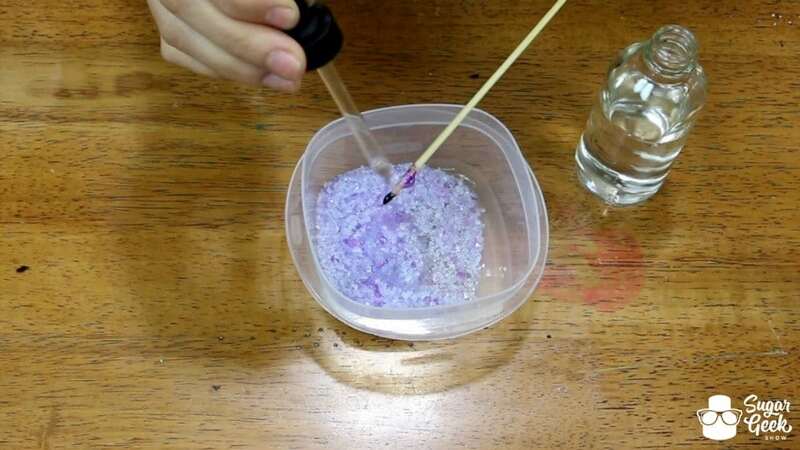 Color some sugar crystals to match your colored isomalt using a little bit of alcohol and food gel. 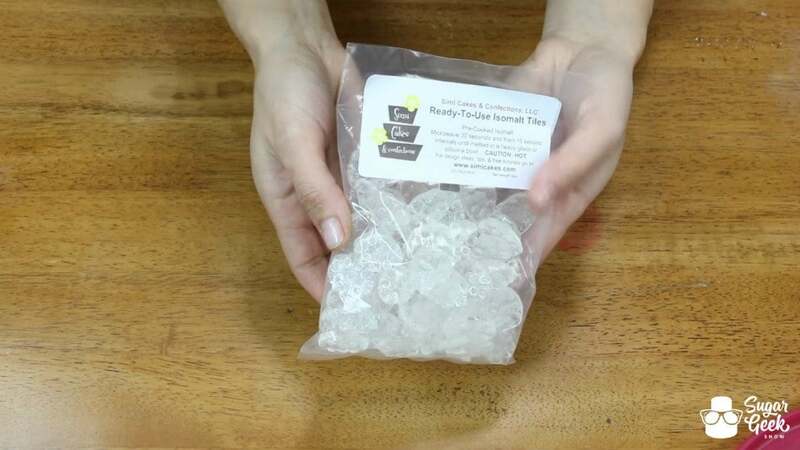 Mix in some sparkly dusts such as diamond dust or disco dusts to add a bit of sparkle and shine to your crystals. 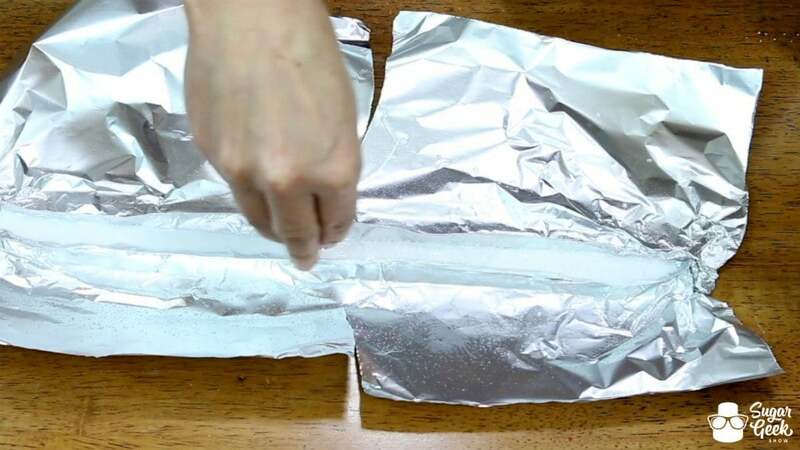 Add a layer of your white isomalt to the foil dam you created. 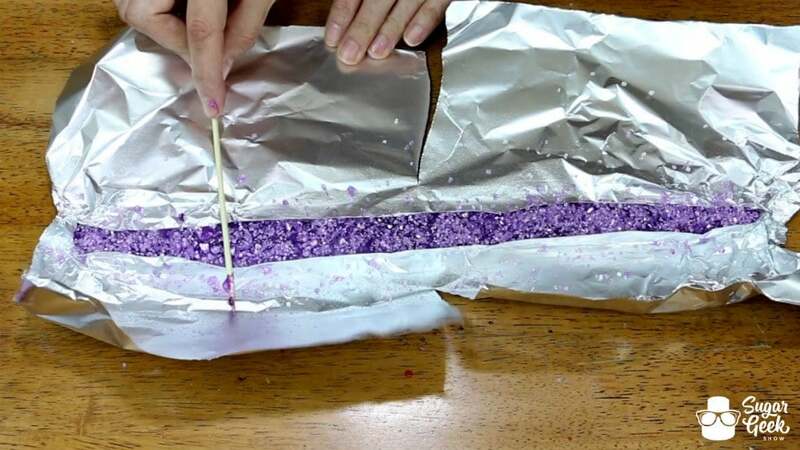 Sprinkle some sugar crystals on top of the white layer. 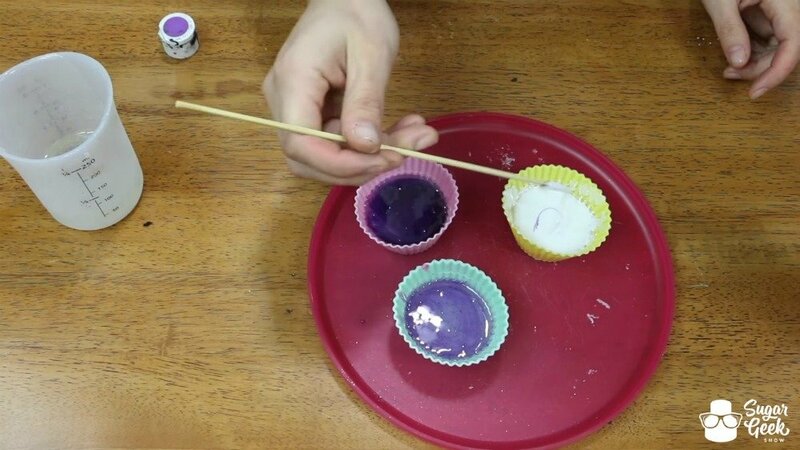 Next, pour in a layer of your lighter colored isomalt. 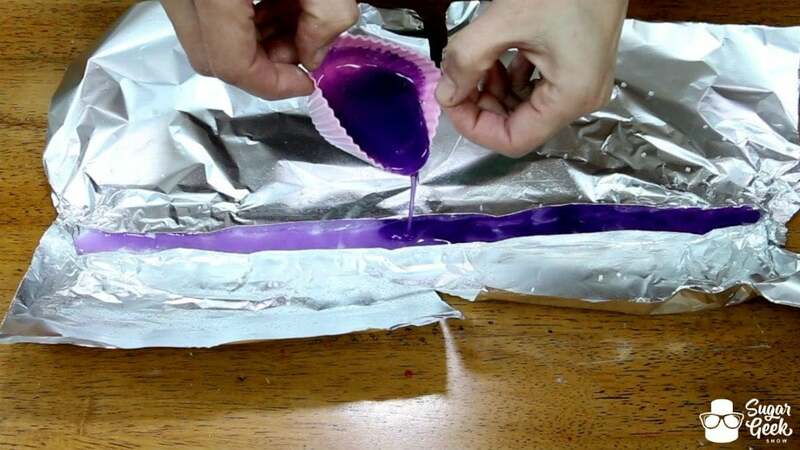 Lastly, pour in a layer of your dark colored isomalt. 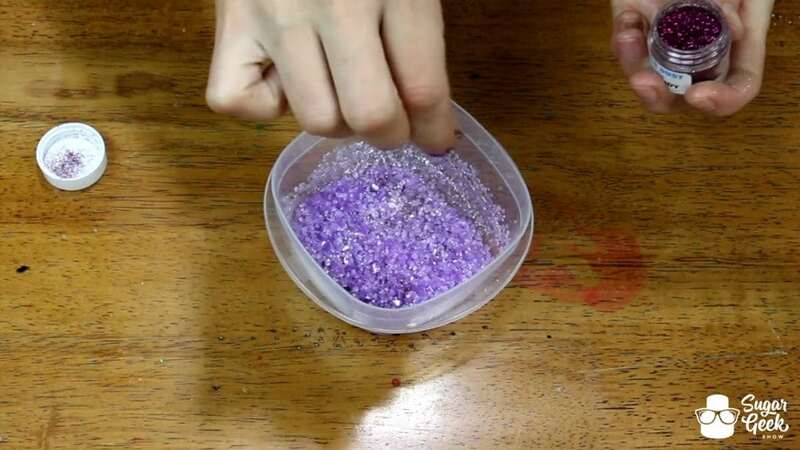 Sprinkle a layer of your colored sugar crystals on top of your dark colored isomalt. 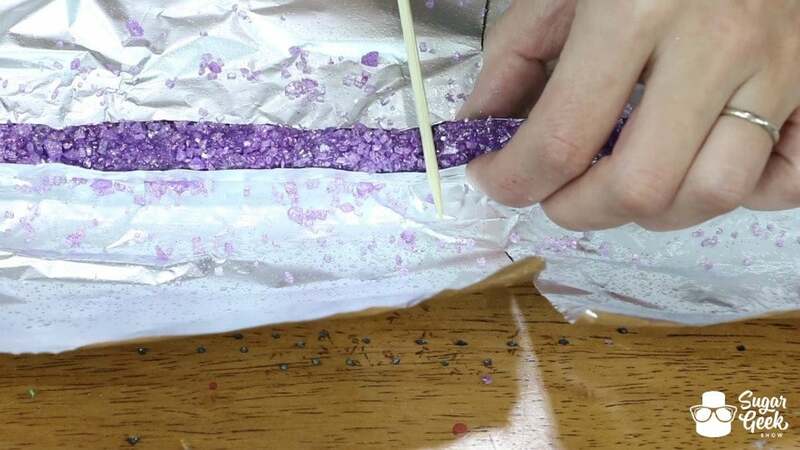 As your geode begins to cool, begin pressing in the crystals and shaping it so that that it looks a bit lumpy and not quite so even. 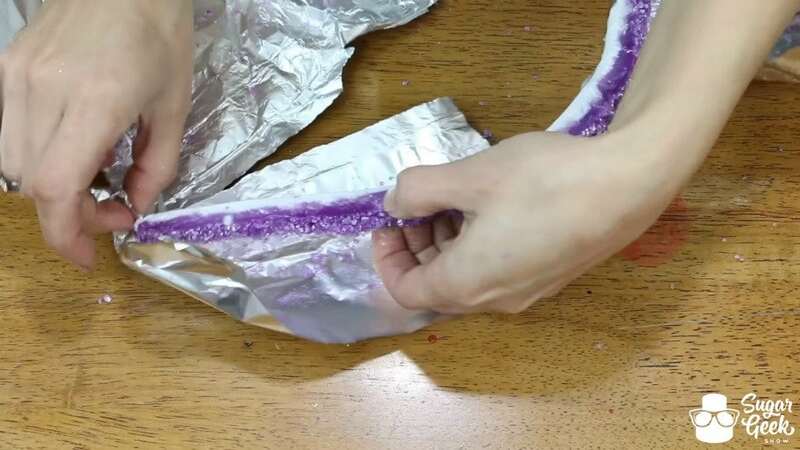 This is a geode after all. 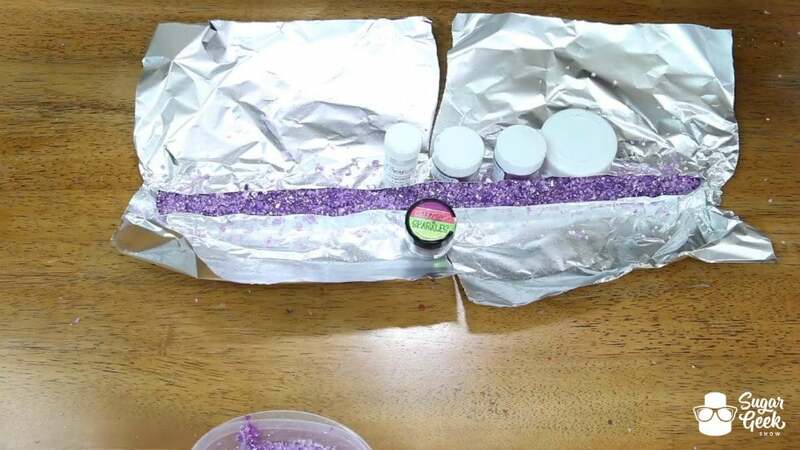 If necessary, use some small bottles to hold the dam in place at the right width while the isomalt cools. 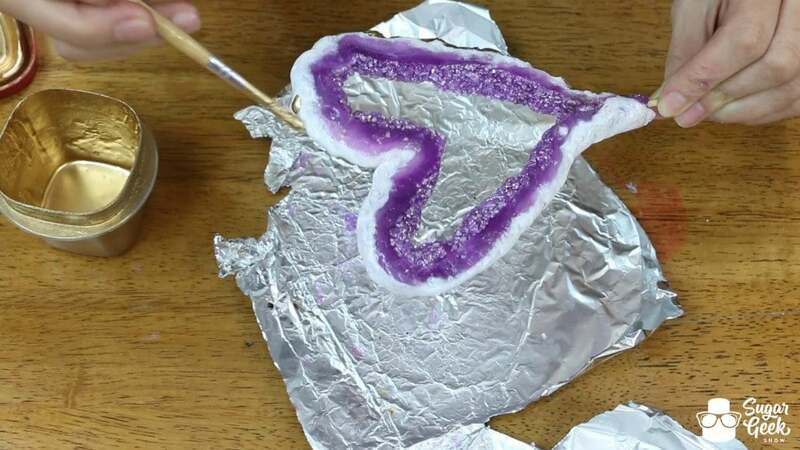 Continue shaping lumps into the geode. 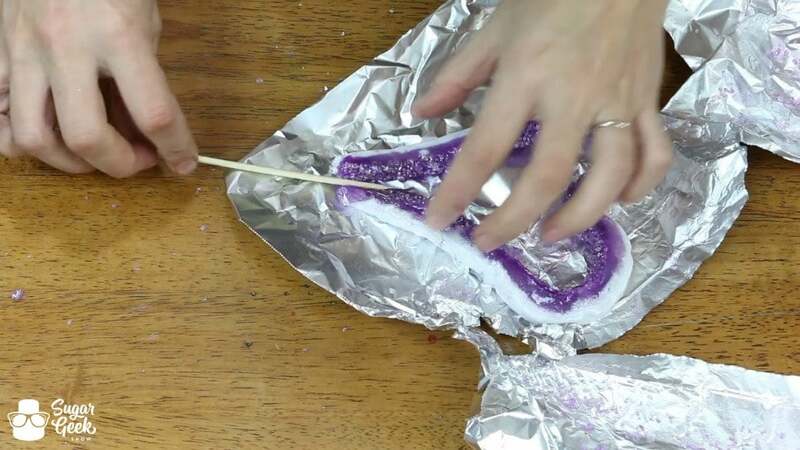 Once your geode has cooled enough to hold it’s shape but is still warm enough to bend, quickly remove your foil and again, if you remembered to spray unlike me, it should come off pretty easily. Working quickly add some texture to the geode, especially the top white layer. 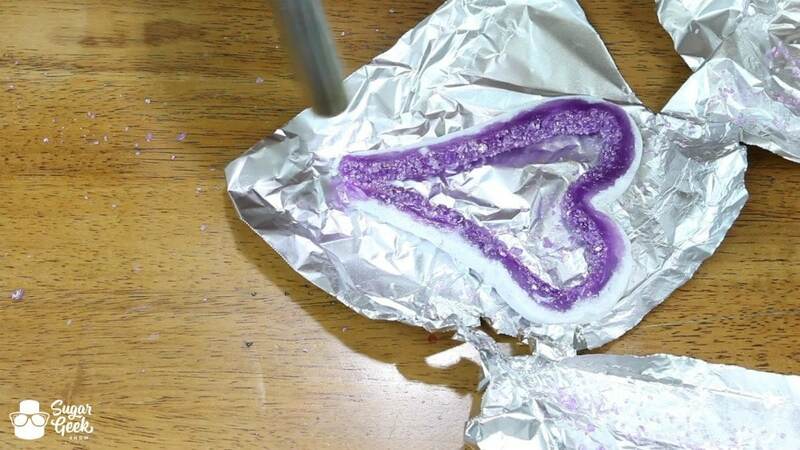 Be sure you aren’t letting the geode get too cool or you will not be able to shape it into a heart. 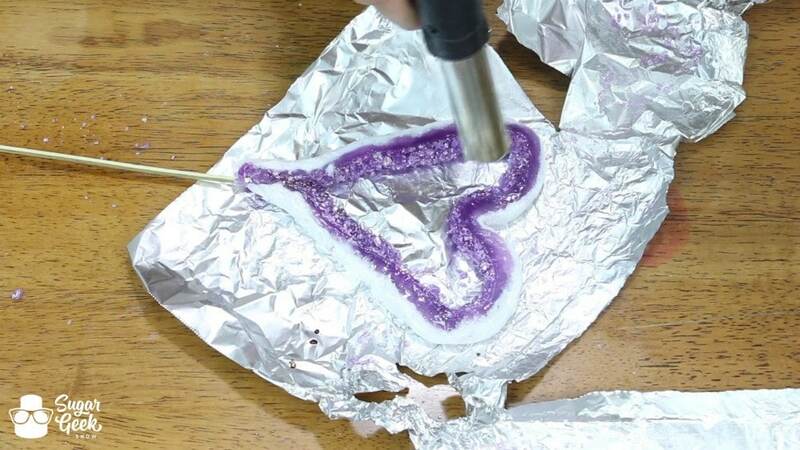 Shape your piece into a heart by pinching in the center and folding the ends around. 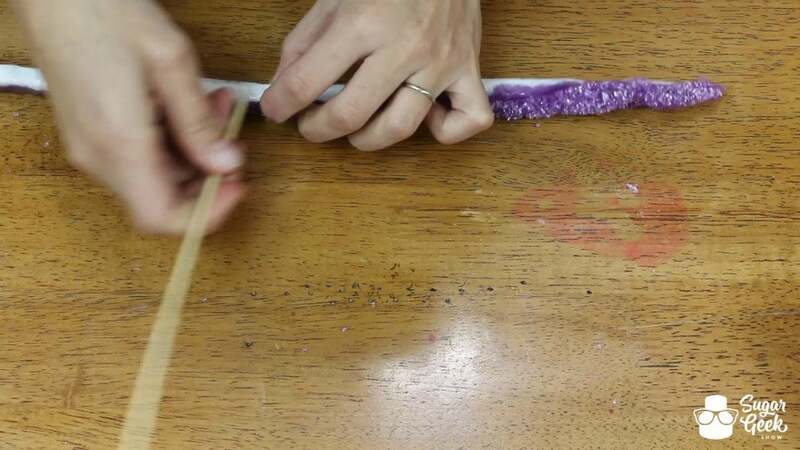 Torch the ends of your geode to soften them up enough to insert a wooden skewer securely in the end. 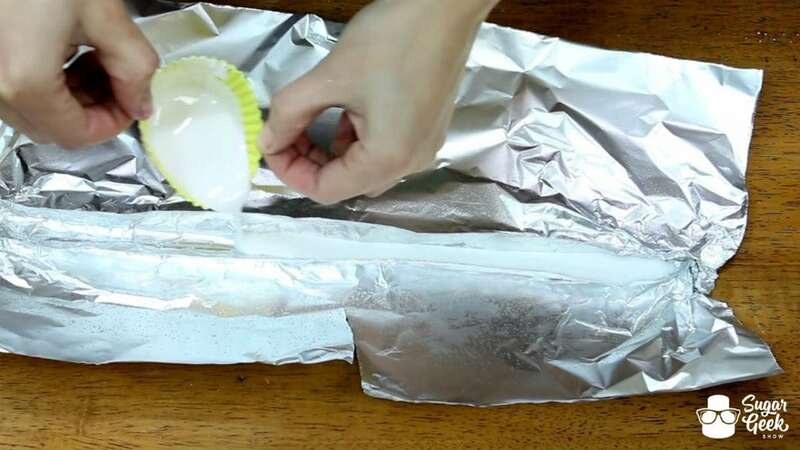 Use the torch lightly on the surface to smooth it out a bit. Last but not least paint the outside edge with a metallic highlighter dust to give it a lovely finish! Liz is using Albert Uster Gold Highlighter here. That’s it! 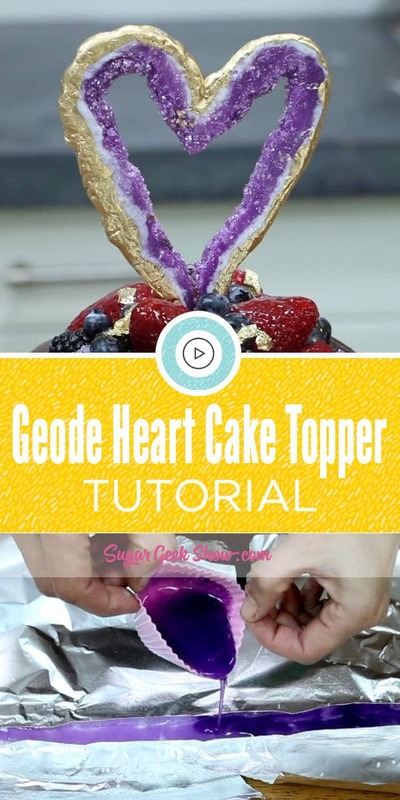 You’ve created a beautiful geode heart topper that’s sure to impress anyone who sees it! They’ll think you put much more effort into it than you did and that’s always a plus right? If you’re looking for an awesome cake idea/recipe to put this beauty on, check out the 24 layer cake tutorial Liz used to put hers on! I mean TWENTY-FOUR layers of delicious man, you can’t pass that up am I right? Links and tutorial below.